About 12 miles off the coast of the Yucatan Peninsula, the island of Cozumel is a world class tourist destination that beckons snorkelers and scuba divers to its crystal clear waters and coral reefs teeming with marine life. Swim with dolphins, head to the ocean's depths on the Atlantis submarine, ride an ATV through the jungle, or get your thrills on speed boat through the ocean waves. Or perhaps you'd just like to relax on a white sand beach with a frothy drink in hand! As a large-scale seller of Cozumel resorts and Cozumel vacations, we are able to offer you unbeatable prices and unparalleled value. Once you have found the discounted Cozumel resort of your choice, please call our resort consultants at 1-800-340-8612 to book your vacation and save money with our first-rate personalized service! 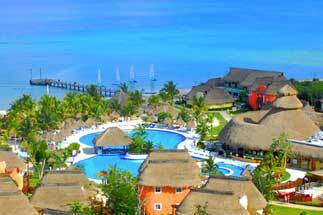 Book your Cozumel resort today with AffordableTours.com, your discounted resort headquarters. Location: Approximate driving time from Cozumel International Airport to Secrets Aura Cozumel is 20 minutes and distance is 17 km (10.5 miles). 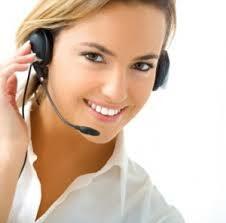 Distance from Cancun International Airport is approximately 1 hour 30 minutes (combined land and boat travel). In a perfect blend of luxury and excitement, Secrets Aura Cozumel is the ultimate adults-only, all-suite resort located on the island of Cozumel. Sitting just 12 miles off the coast of Mexico's Yucatan Peninsula, Secrets Aura has it all. 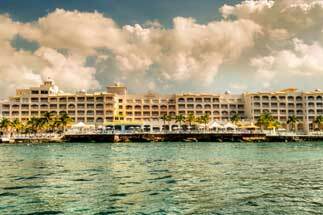 Location: The Cozumel Palace is located in the heart of Cozumel Island on the beautiful Caribbean Sea, on the edge of the world famous Palancar Reef and within walking distance of the main plaza. 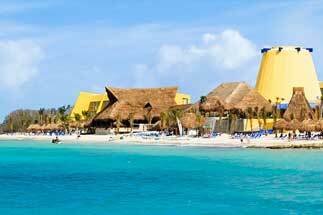 Cozumel Palace is the choice for families and water sports lovers searching for an all-inclusive resort in Cozumel. Location: It takes approximately 20 minutes to get to and from Cozumel International Airport (CZM). Or, it takes approximately 15 minutes to get to and from the Ferry Dock downtown. At the Occidental Grand Cozumel, you'll enjoy all-inclusive luxury accommodations and diving at one of the world's most amazing reefs. 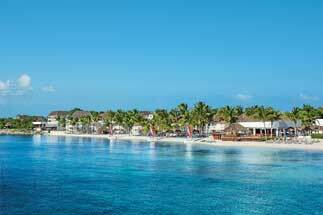 Location: Beachfront hotel on southwest coast of island - 20 minutes to Cozumel Airport, 2 hours to Cancun Intl Airport. 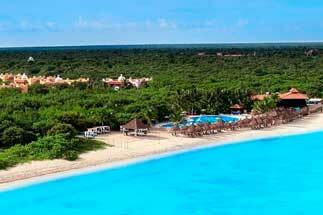 Located on the southwestern coast of the island, the all-inclusive Iberostar Cozumel sits on the edge of a beautiful bay boasting a fine sandy beach and a unique freeform lake-style pool area. Location: Approximate driving time from Cozumel International Airport to Sunscape Sabor Cozumel is 20 minutes and distance is 17 km (10.5 miles). Distance from Cancun International Airport is approximately 1 hour 30 minutes (combined land and boat travel). 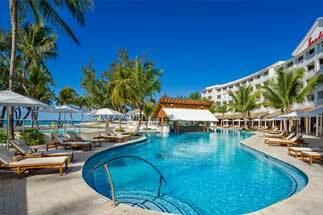 Sunscape Sabor Cozumel is located on the beautiful island of Cozumel, just 12 miles off the coast of the Yucatan Peninsula, and offers families, couples and singles and Unlimited-Fun getaway in a picturesque destination. Location: Located on the northwest of the island with white sandy beach. 3.5 miles from downtown and airport. Located on the northwest of the island with white sandy beach. 3.5 miles from downtown and airport.